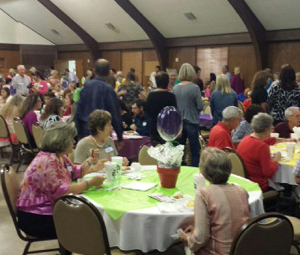 More than 175 people attended “The Sweetness of Mercy” event last Sunday to benefit Mercy Multiplied. 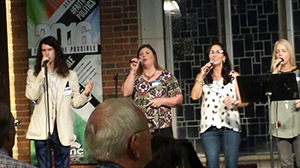 Hosted by the Missions Committee of the First United Methodist Church of Monroe (FUMCM), the event raised nearly $9,000 for Mercy’s residential home located in Monroe, Louisiana, one of four Mercy homes in the U.S.
Pastor Lynn Malone and the FUMCM congregation have been faithful supporters of Mercy for many years. Jan Nelson, chair of the FUMCM Missions Committee, also serves as a member of the Monroe Mercy Community Board and led her Missions team to orchestrate a powerful program highlighting Mercy. The evening began with a fish dinner catered by Catfish Cabin. Several other area restaurants and bakeries and women from FUMCM provided tables full of sweet desserts. Following dinner, “Sound Faith!” led a moving time of worship. Cathy Whatley, FUMCM Missions team member, then introduced Mercy’s Community Relations Manager, Dana Owens; 2004 Mercy graduate, Lyndsey; and current Mercy resident Natassia to share about the mission and ministry of Mercy Multiplied. 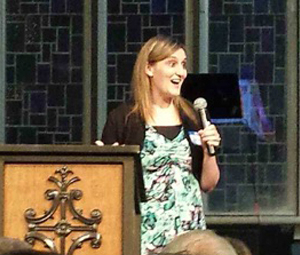 Lyndsey shared that while her life before Mercy was a very dark place of depression, attempts to take her own life, and numerous psychiatric hospitalizations, she met God in a very real and powerful way at Mercy. Lyndsey now lives in great freedom and peace and is married with two children. 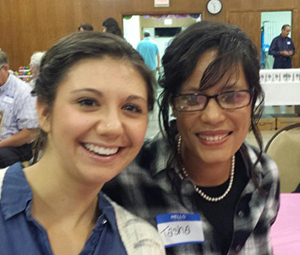 Natassia entered the Monroe Mercy home in April of this year and is excited to be graduating on September 20th. She spent the majority of her life in Guatamela with her parents who served there as missionaries. She loved doing ministry with her family and had a strong relationship with the Lord. However, after being sexually abused by a family friend, her life began to unravel. Natassia returned to the U.S. at the age of 16 and had a difficult time adjusting to her new surroundings. Life spiraled out of control in a number of ways, until she found Mercy. While in the program, Natassia has found a renewed relationship with the Lord and a newfound hope and freedom. 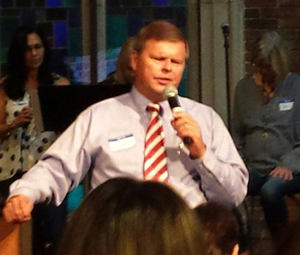 At the close of the event, Pastor Lynn Malone, Rev. J. Roddy Taylor, Rev. Chris Winterman, and FUMCM members gathered around the Mercy residents for a special blessing and prayer. The Paper Market, Thurman’s Food Factory, The Coffee Bean, Albritton’s Cake House and Catering, The Bakery Boutique, Daily Press, Daily Harvest, Newk’s Eatery, Lea’s of Lecompte, Not Just Pie, Restaurant Sage, Janie McGuffee and CC’s Coffee. Mercy is grateful for the partnership of FUMCM and the support of the Monroe community. Click here to learn how you or your organization can partner with Mercy and support young women as they break free from life-controlling issues.